Tag Archives: Walsall Sunday School tea. ‘The Lord of Hosts is with us, the God of Jacob is our refuge, It is Thou that savest us from our enemies. We make our boast of God all day long and will praise Thy Name for ever’ (1). ‘O God the Protector of all them that trust in Thee’. Collect & Psalms:- Fourth Sunday after Trinity (2). A burst of sunshine and the ‘Dark Cloud’ vanished – the ‘Buoy’ has at last come Home (3). Although I am so far from you as Birkenhead you will no doubt feel me warmly nearer to you, won’t you Mumsie? Turn right over for page 2. Ha ha har! You see me Dearies at Home, no one, not even Apollo or Jupiter or Penelope, Hermes, Mars, Saturn, Adonis, Orpheus, nor strong & mighty Thor, nor boisterous rude Boreas, yea and cunning Medusa or any other of those ancient gods can prevent me, by their all magical powers from writing my usual Sunday letter to my Home sweet Home (4). As afore-mentioned in the PC to Dad yesterday I am training my left hand to do something for its living. This Sunday morning is beautiful. I have had my ‘Bon Breakfast’, of bread & butter with a new laid egg & refreshing tea. 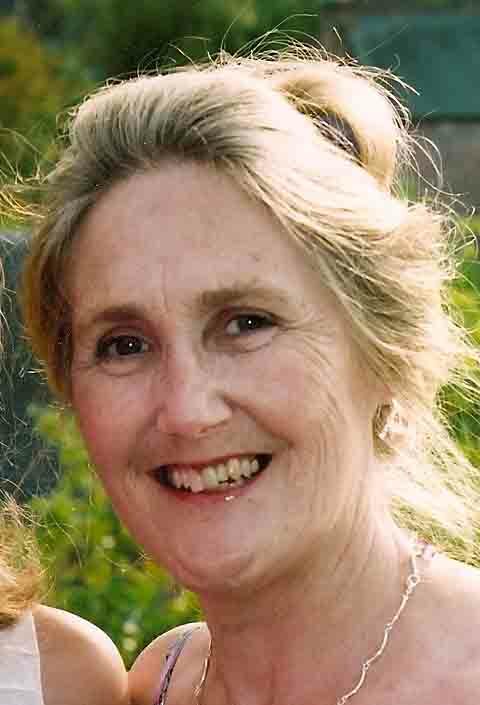 I am now sitting up in the cot to write something for you to pass away a happy moment in our sunny garden, where very nearly two years ago you, my darling Mummy, lavished a nice garden tea for those little Sunday School Boys of mine (5). The Cenacle, Red Cross Hospital, New Brighton with wounded soldier & tea-party on lawn. Pen & Ink. Arthur H. Hibbett. 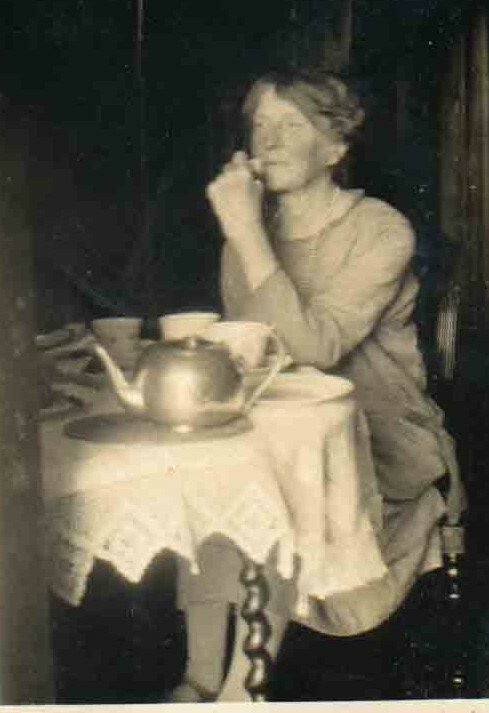 1916-1917. Copyright. The Happy Warrior. George Frederick Watts. Now dear Mummy don’t be afraid of me just saying that the wound is painful because I wish you to know that when I am trying hard to bear the pain. 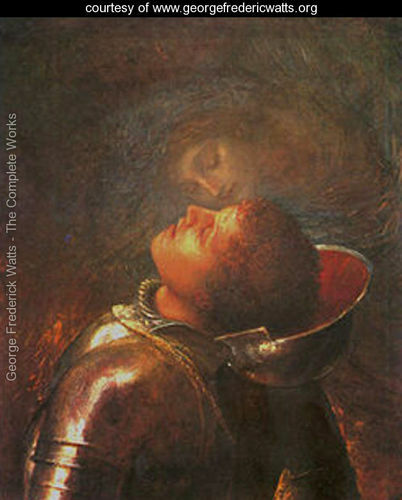 I like to picture you as that angel in the famous painting ‘The Happy Warrior’ (6), kissing my brow. Yes a Mother’s kiss will do lots to heal a wound & a Father’s all wise & quiet sympathy, like my Dad, will act with the same wonder. A pause for a rest – and now once more to the breach – my left – across paper – Quick march! 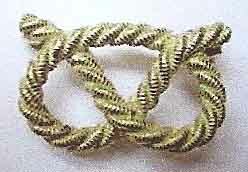 Left – right – left. My word the Lancashire lassies can’t arf cheer, talk about the most excitable & most embarrassing moment I have ever had. When we passed through Southampton on the Thursday we arrived, I found that both rich & poor had not grown the least tired in cheering & waving their hands & smiling; from every window, door, or corner along the side of the Railway, people gave us their appreciation. As for Birmingham, where we passed through at 7 pm, they had the police to keep the crowds back – with ropes too, but even that preventative could not stop some eager ‘bird’ to flutter under the rope & throw a gift into the carriage. Nurses of the St John’s Ambulance came with big flat trays on which were piled oranges & other fruit; on other trays there were meat sandwiches, while others had pipes & smokes & other sweets. Then, as the train passed out, the nurses could be seen to stand to attention. The Finale came when we arrived at Birkenhead. Lined all along the platform were private cars in which the owners drove us to New Brighton (where I am now). As soon as the train stopped a voice was heard to shout ‘Double’ and – like a streak of lightning – there rushed down dozens of civvies to the carriage doors (which were of course locked) (7). Then each civvy took a ‘Woundy’ Tommy & helped him into a car. As each car left the station the occupants received stunning cheers from the dense crowd which stretched through the entrance of the station & all up both sides of the first street. I leave it to you to imagine how I looked & felt. Now it is all peaceful in this sunny room where I can have my ‘bit’ of Sunday easier than those previous. I read the Collect & Psalms for today, as you will see by the special texts I have picked out & put at the head of this letter. Never before have I felt the Psalms to be more appropriate for these fighting days. After the experience of trench warfare and artillery bombardment I still believe in that principle that is signified in verse 7 of Psalm 44 ‘But it is not my sword that shall help me, but it is Thou that savest us . . . ‘. Then the Collect too is most suitable for those concerned in the Great Allied Offensive. What too can be more encouraging and comforting than the first verse in the Epistle. ‘I reckon that the sufferings of this present time are not worthy to be compared with the glory that shall be revealed in us’ – which applies to those at Home as well at to those at the Front. We are getting excellent food here, fresh fish & good milk puddings & stewed fruit. What a delight to taste them after so long without. Yes I have a great, great deal to be thankful for. This afternoon is also sunny. I am trusting you too are having fine weather & an ideal Sunday. I hope you & Ida got the brooches which, (as I told Harold in a letter I sent, a day or so before The Saturday) were handmade by a Soldier’s crippled friend in England. Ida’s parcel & your letter following that tin parcel came just happily timely, as did a nice parcel from Miss Brookes*. I did think I was lucky in receiving them so timely & you must know how happy I felt when I got your parcel with the current bread in, for although it came on the Wednesday of that week we all thought we were going up from those Huts where we were spending a rest that Wednesday night (8). We eventually went to the trenches on the Friday night, and arrived early on the Saturday morning, only having five or ten minutes to fetch & drink some soup. At which time I saw Sydney pass me with his Platoon. ‘‘So long Sydney!” I greeted him & since then I did not see him again. I am hoping for the best, & it will not believe anything until there comes something definite & official (9). ‘Let us prove all things’, sais St Paul. I believe or rather trust in Those Heavenly Higher Hands that dear Brother Sydney will too ‘finally not lose the things eternal’ (10). Now dears, Mother & Father I will close my usual S. letter with the same Sunday Wish that I hope you are enjoying the Day with Peace reigning in your Hearts by Faith & spending a Happy time all together with Basil (11) – (The Dodger that comforts Mother) – Harold & Hilda, to whom I send my love as well as to my affect. parents. ‘FONCQUEVILLERS CHURCH BEFORE GOMMECOURT’. Drawing with Left Hand & from Memory. The last thing Bertie saw of Foncquevillers, 1st July 1916. A.H.Hibbett. Copyright. 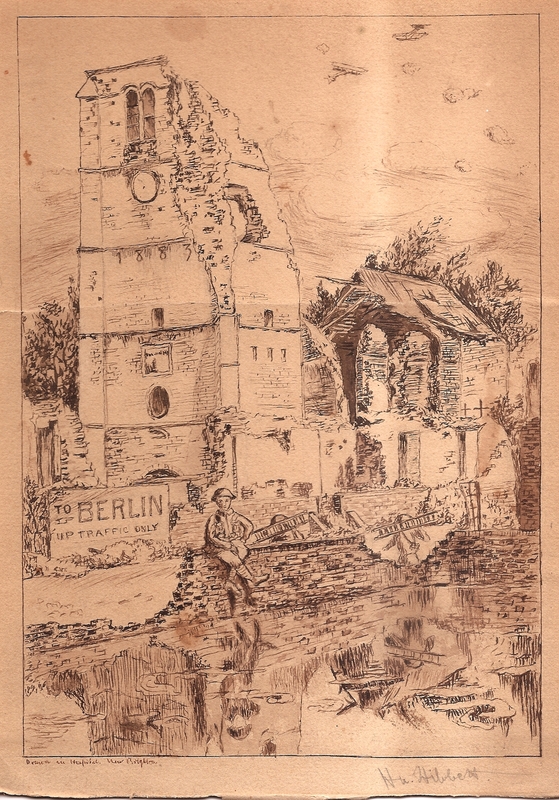 Pte Bertie Hibbett may have shown this drawing of the ruined Church of Our Lady, Foncquevillers, to one of his nurses; she then gave him a Postcard sent her by her boyfriend, M. Nelson, R.E. 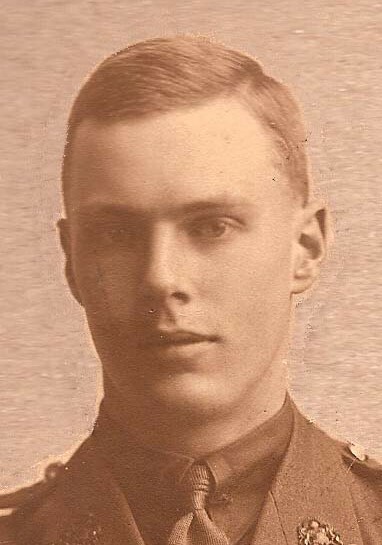 in Oct 1916. My father then worked on a pen & ink sketch of his own, which I remember always hung in his study. My Dad has kept one soldier sitting on the wall, reflected in the water & added the famous sign ‘To BERLIN. Up Traffic Only’ – and soldiers carrying ladders. In his last Letter of 27th June before the Battle, he said he had at last managed to find his Mother ‘a few June roses‘ – hence the note ‘wild roses‘ in his Letter’s drawing above. 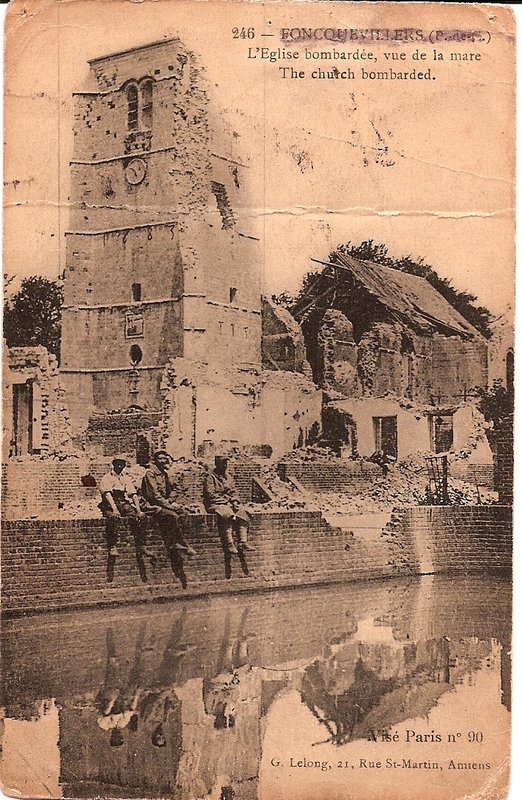 Strangely enough, when my sister & I arrived at Foncquevillers by bike a hundred years later, the Church clock said five to three, exactly the time the clock had stopped during bombardment – & as Dad remembered it. (1) ‘The Lord of Hosts is with us’. Psalm 46.7. (2) ‘The God & Protector of all that put their trust in Thee.’ Collect. Bk of Common Prayer, 1662. (3) Keep the Home Fires Burning:’There’s a silver lining through the Dark Cloud shining’. Ivor Novello. Boreas: God of the North Wind. 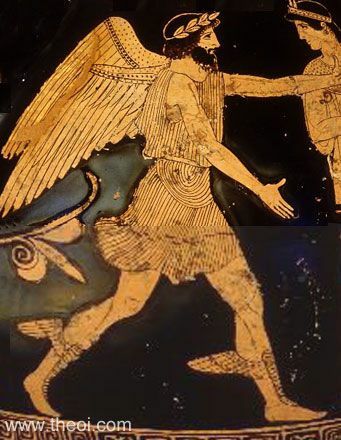 (4) Greek & Roman mythology & art was all part of a classical education in the early 20th Cent. From 1907-1921, George G. Harrap & Co. Ltd published the series Myths & Legends (of the world) which my father collected after the War. (5) Bertie Hibbett’s 19th Birthday tea for his Walsall Sunday School pupils, at No 95 Foden Rd. See Hibbett Letter 12th July 1915. (7) Ambulance train doors locked: to prevent scale of Somme casualties affecting national morale? Humbercamps. 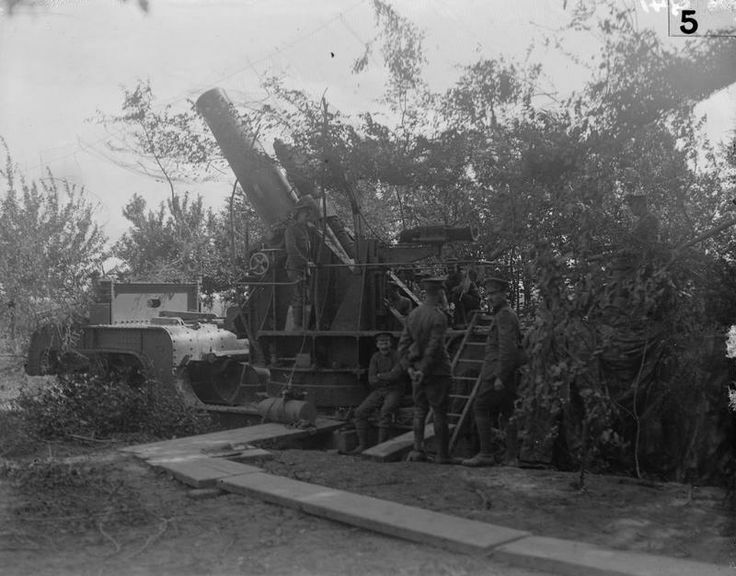 Howitzer elevated ready for firing. 1st July 1916..
(8) Humbercamps Huts: 3 miles from Front Bertie expected to march at 2.00 am. 29th July. Battle delayed 2 days. (9) The South Staffords Roll Book, held in 1/5th S Staffordshire Regiment Museum, Whittington Barracks, Lichfield reads, simply :- ‘Sydney Hibbett: Missing. Expectation of Death. 1.7.1916’. Bertie Hibbett had probably not yet told his parents the detailed news he had heard of Sydney. cf ‘My Memories’. 1967. It was several years before they had confirmation of death. (10) I Thessalonians 5.21; & Collect for 4th Sunday after Trinity. 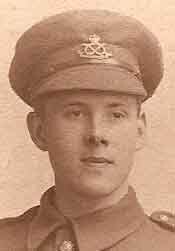 NEXT POST: 19th July 1916. ‘With regard to your brother Syd, I fear the worst has happened’. 'The Happy Warrior' Wordsworth & Watts. 'To Berlin Up Traffic Only' Foncquevillers 1916.Foncquevillers Church of Our Lady 1916.Keep the Home Fires Burning.Left Hand Drawing 1916.Psalms & Collects 1916.The Cenacle Red Cross Hospital New Brighton 1916-1917.Walsall Sunday School tea.